Last week I learned that lightning really can strike twice! Dana Pounds, Executive Director of Nature’s Academy, has not only won a $50,000 grant from the Lightning Foundation. But Manatee County has officially proclaimed that April 20, 2013 is Dana Pounds Day, in recognition of her contributions to the community. Congratulations, Dana! 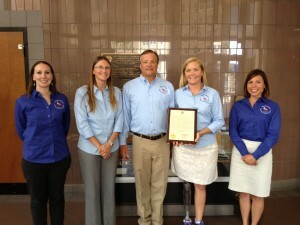 April 20, 2013 is Dana Pounds Day in Manatee County! Nature’s Academy is a nonprofit that teaches kids about the richness and complexity of the environment. Founded in 2007, their goal is to inspire kids to become better stewards of the Earth’s limited resources. While this is a serious mission, they manage to accomplish it through the endless and varied fun of outdoor field trips. Many people know that the best way to learn is by doing. Nature’s Academy takes that to heart by bringing the classroom outdoors. They make environmental concepts real, immediate and understandable for kids. Since opening, more than 25,000 kids have experienced the beauty of the beach while learning about the science behind the scenery. These students come from 41 states. Testing shows that about 80% of them show learning gains over the course of the program. The Lightning Foundation grant will be used to fund local fifth grade classes in Manatee and Pinellas counties to participate in an Island Adventures project, free of charge. To date, over 4,000 kids have enjoyed this program. When school budgets were slashed, Nature’s Academy stepped up with this program to ensure that a focus on science literacy would continue. The gift of $20,000 to the Sustany® Foundation stemmed from Dana’s desire to “make sure the money was going to the best grassroots organizations where it would truly translate into programs.” She got to know the Sustany® Foundation when it became one of the original donors to Nature’s Academy. She is confident that the gift to Sustany® will be put to good use. Mark your calendar: June 8 is Family Fun Day for Nature’s Academy at Fort De Soto Park. Email Kristin@naturesacademy.org for more information and to register! For more information about Nature’s Academy, contact Dana Pounds at 941-538-6829 or info@naturesacademy.org.